The information presented on this page was originally released on April 18, 2016. It may not be outdated, but please search our site for more current information. If you plan to quote or reference this information in a publication, please check with the Extension specialist or author before proceeding. One of the most fun parts of serving as the Southern Gardener is getting to share so many great plants with gardeners all across Mississippi and beyond. Some plants are new introductions, some are old reliable choices, and all get to be called my favorite from time to time. This week, I want to get everyone ready for the summer season, and I don’t think there are many better choices than purple coneflower, known botanically as Echinacea. Echinacea is native to North America. In fact, there are nine different species. 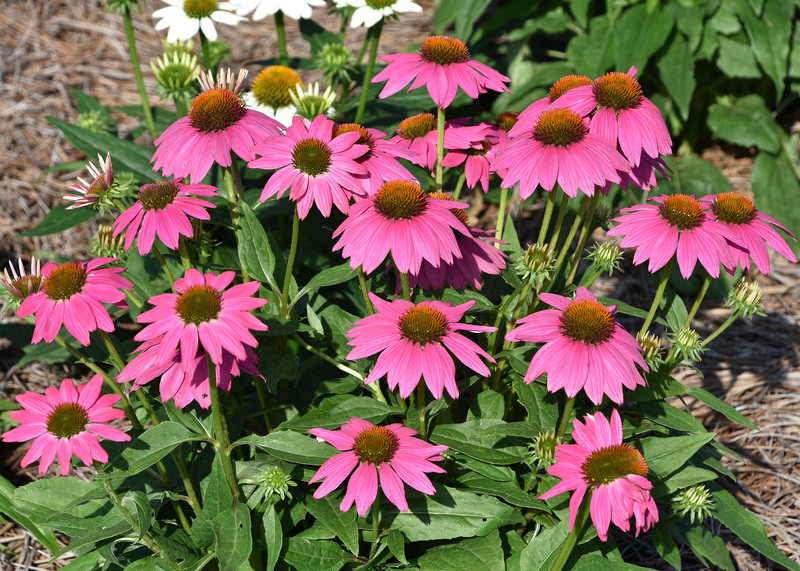 However, the species chosen most for ornamental landscape use is Echinacea purpurea, the Eastern purple coneflower. It’s hard to argue with a plant that grows up to 3 feet tall and wide and has huge 2- to 4-inch purple flowers with dark centers. Everyone loves coneflowers in the summer. A lot of effort has been put into the breeding process, and some fantastic selections have been brought to market. For instance, PowWow Wild Berry was selected as a Mississippi Medallion winner in 2014 and has lived up to this award. There is the All-America Selection Cheyenne Spirit with its multicolored flowers of white, orange, yellow and red. But I want to take us back to a time when purple was the only purple coneflower color. We’re going to ignore the species Echinacea paradoxa, the yellow purple coneflower. One of the first mainstream coneflower selections was Bravado. Selected for its large and profuse flowering habit, it made for a bold and sturdy landscape plant with its dramatic reddish-purple flower center cone tinged in orange. Bravado was popular because the seed was widely available. Then, one day a miracle happened. A Bravado seedling produced white flowers. White Swan has the same size of flowers and the same plant vigor as Bravado. Together, they make an outstanding landscape combination. These two old Echinacea selections are still widely available today. Once established, these plants are among our hardiest selections, able to withstand our hot and dry summer. Feed them sparingly in the spring using a balanced, slow-release fertilizer, about 2 tablespoons per plant. If you prefer, you can use high-quality compost or other organic fertilizer. Coneflowers may be the ideal plant for busy gardeners because they thrive on neglect. I think they grow better if you don’t even look at them as you walk by in the landscape. They tolerate a wide variety of soil types, from tight clay to sandy. Irrigation is needed only when the plants are newly set out. Once established, normal rainfall is sufficient, except during extreme droughts. The crown of the plant is susceptible to rot conditions. This is not a problem in the summer but can become one during the cool, moist winter months. 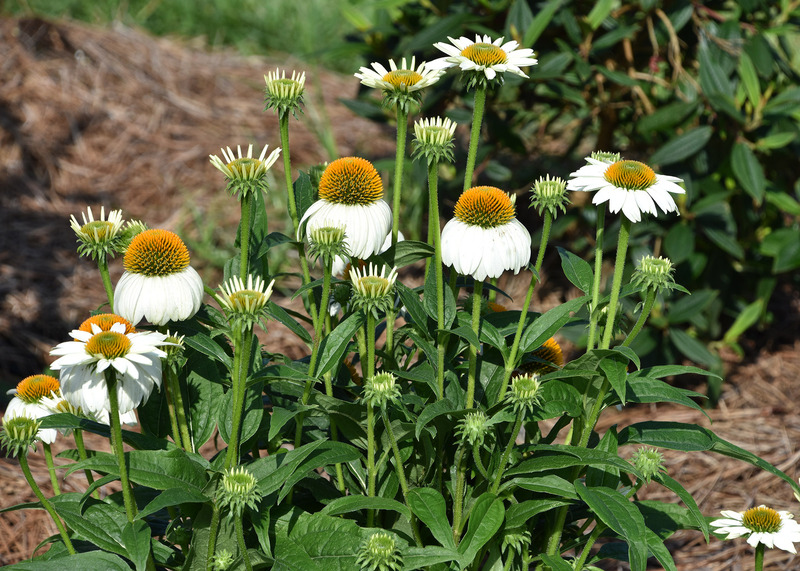 Mississippi gardeners can address this problem by planting coneflowers in raised beds, which helps keep the plant crown drier. On the coast, the coneflower is a tender perennial because of the winter conditions, so use it as an annual. 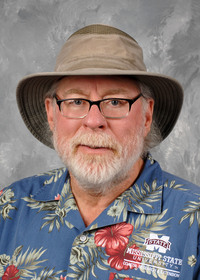 Don’t get caught up in the whole annual/perennial classification. Coneflowers will flower for up four months. For additional information on Echinacea, see my Mississippi State University Extension Service publication “Purple Coneflowers for the Mississippi Gardener” at http://bit.ly/20QZYsz and the Southern Gardening TV segment on purple coneflowers at http://bit.ly/1WBqHc4.